The year is almost over and it seems like it just started. 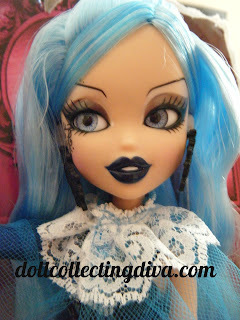 We are eagerly awaiting the new year and several new doll releases. We have all sorts of goodies planned for the new year some will be exclusive to Facebook or Twitter so be sure to like us and follow us. 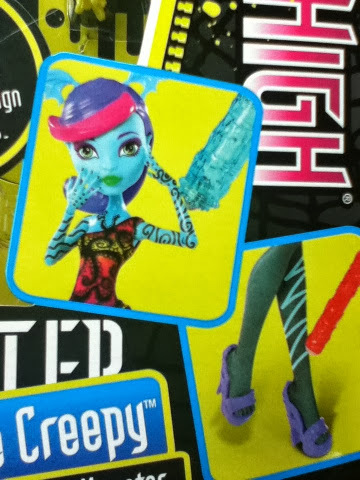 We are giving a way a Monster High Ghoul Spirit Spectra doll. The giveaway goes from today December 29 until January 3, 2014. 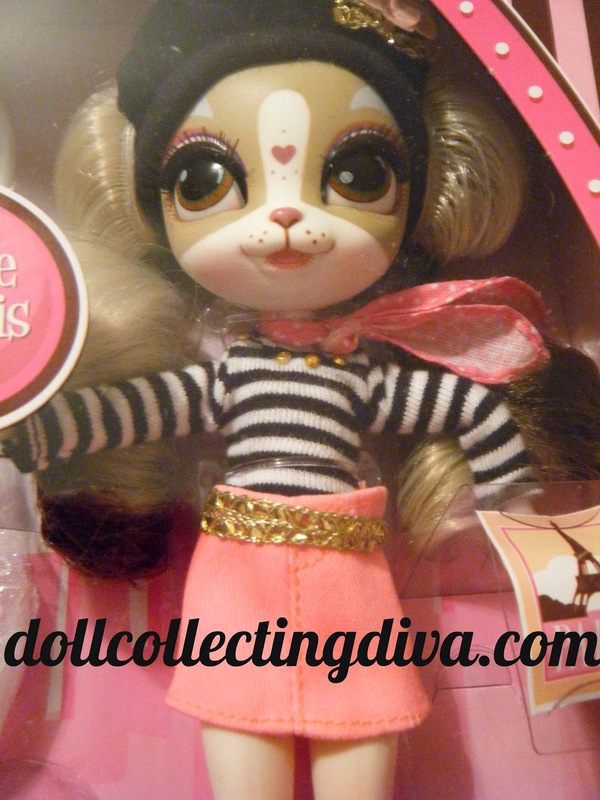 Mandatory entry is by leaving us a comment telling us what dolls or doll lines you are looking forward to next year. Just leave a second comment letting us know which ones you did. I will notify the winner via email. Good luck. There are a few girl sized items left, other than that its officially time to archive Molly and Emily. As of now all of Molly's and Emily's items are in stock. Molly's Skating set is backordered until the end of November. Molly's paperback book box set is now Sold Out online. Molly's accessories: backordered until the end of November. 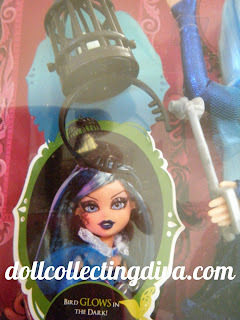 Saige's Hot Air Balloon set is backordered until early January. Saige's dog Rembrandt is no longer on backorder. Saige's Pajamas are backordered until mid December. Saige's dog Rembrandt is backordered until early December. 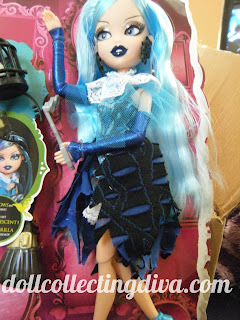 Saige doll and book backordered until early December. It's time to start updating on what Saige items are on the way to being sold out before the end of the year. 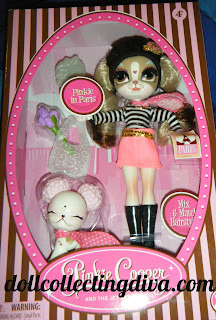 I have been trying to write this review for awhile, and it originally started as a review of Pepper, then I saw the Pinkie in Paris set and had to buy it. 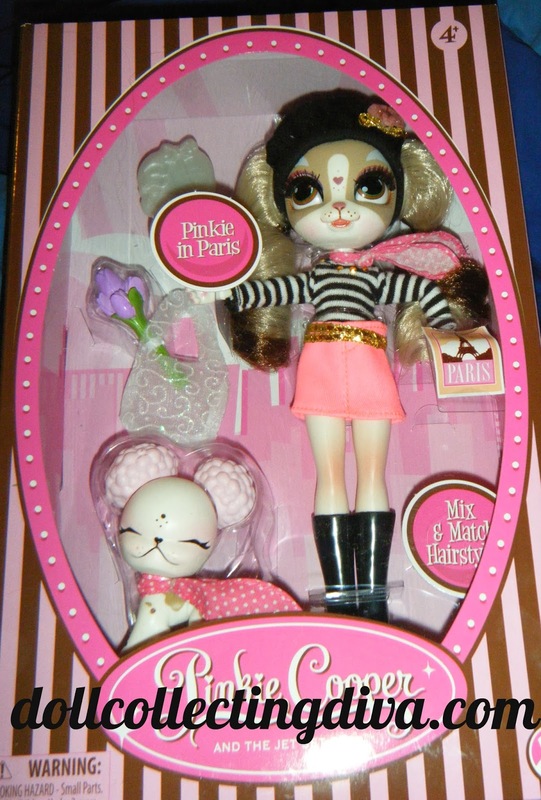 The set includes Pinkie, Li'l Pinkie, a hairbrush, a Paris sticker, a bouquet of purple flowers, and a tote bag in a pink and dark brown striped box (that reminds me of a cupcake store). 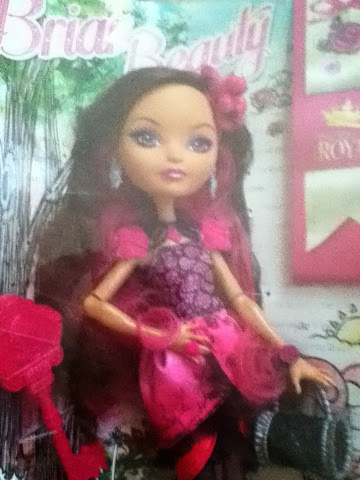 Pinkie is wearing tall, black, open toed boots with gold heels, a pink denim like skirt with a gold belt. The skirt has a loop sewn inside for one of her legs to go through and help keep her skirt up. She has on a long sleeved black and white striped body suit with gold stones at the collar, a black beret with a pink flower, and a pink scarf with white dots. 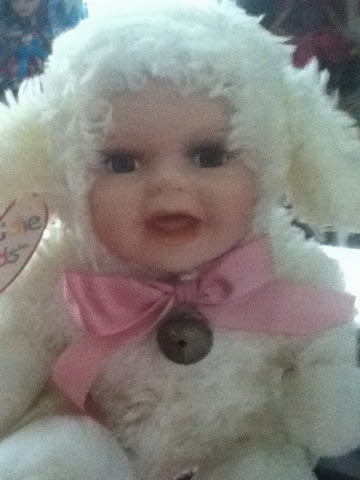 Her ears are reversible and have blonde and brown hair. 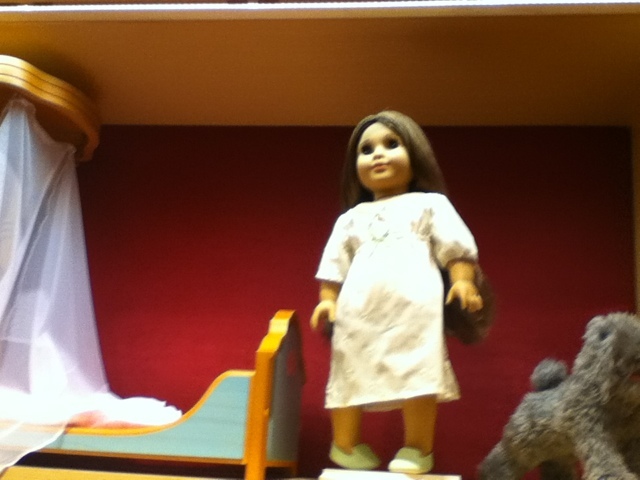 Her body is mostly white and her knees have a pink blush to them, her left leg has four brown spots. Her finger nails are pink and there is a pink heart on the inside of each of her hands. Most of her head is a light tan color with some white detailing. She has a dark pink heart and four small dots between her eyes. 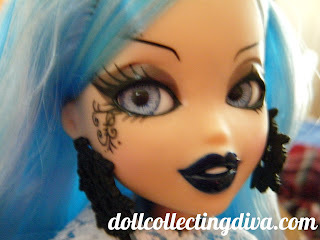 I love her eyes, she has applied upper lashes and painted on lower lashes, her eyes are brown with a small green line around them. 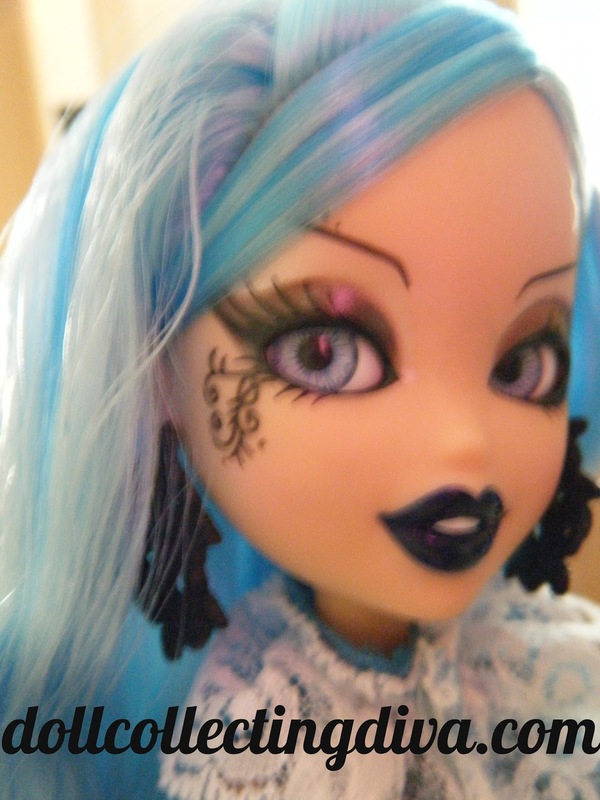 She has light pink and dark rose colored eye shadow with a purple line separating the two colors. Her beret feels like its made of a black felt like material with a plastic pink flower attached to it with some of the gold tinsel stuff that the belt is made of under it. The bouquet is flexible plastic four long stem purple roses, the bag is roughly cut but cute and is made out of medium thickness mesh material with swirl designs on it. 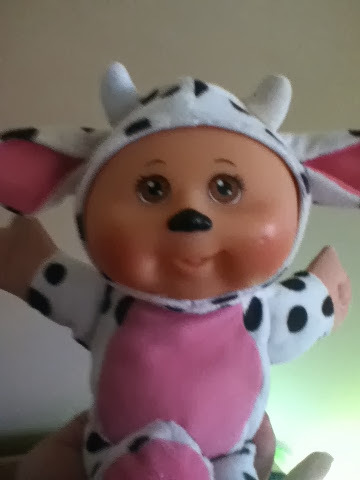 Lil Pinkie is very cute, and looks like she is smiling so big that her eyes are squinted shut. 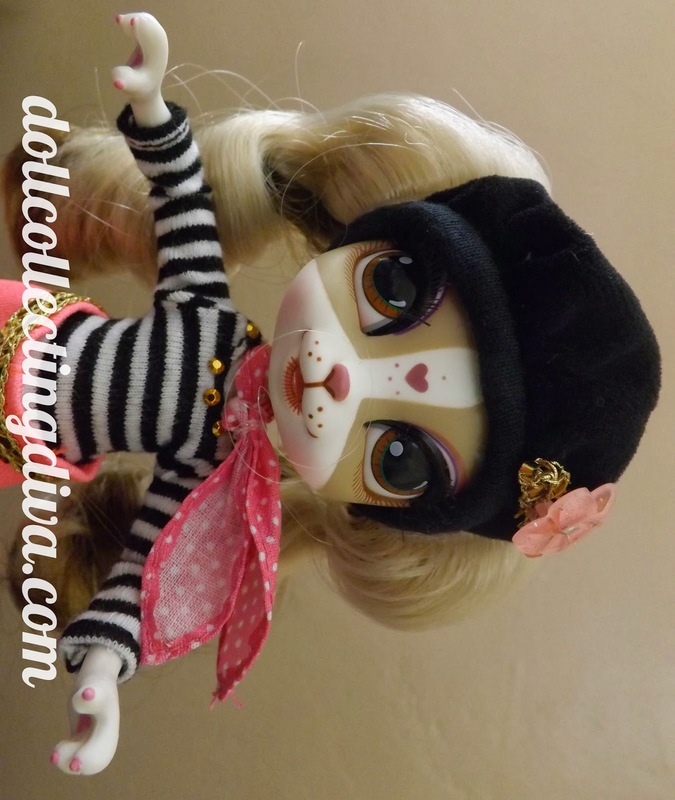 Her ears are removable too and are pink pompom designs. She has on a scarf that matches Pinkie's, and has a light blush at her feet and eyes. She is also mostly white with a few brown spots, one of which is heart shaped on her back left leg. 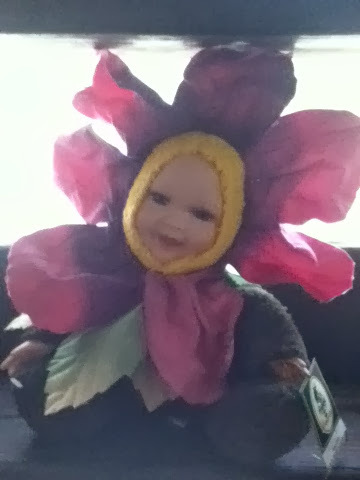 Her head turns and her nose is a black heart, and her other facial features are black. Overall I think this set is wonderful and I absolutely love Pinkie Cooper, her face is just so adorable. I think this line is very innovative and I look forward to seeing what else they come up with. So I thought the rain had ruined our day out, but on the way home the rain slowed. While we were driving home we went around a turn and all I could see was a huge rock formation. As we got closer I could see people rock climbing all the way on the tippy top of the rock face. 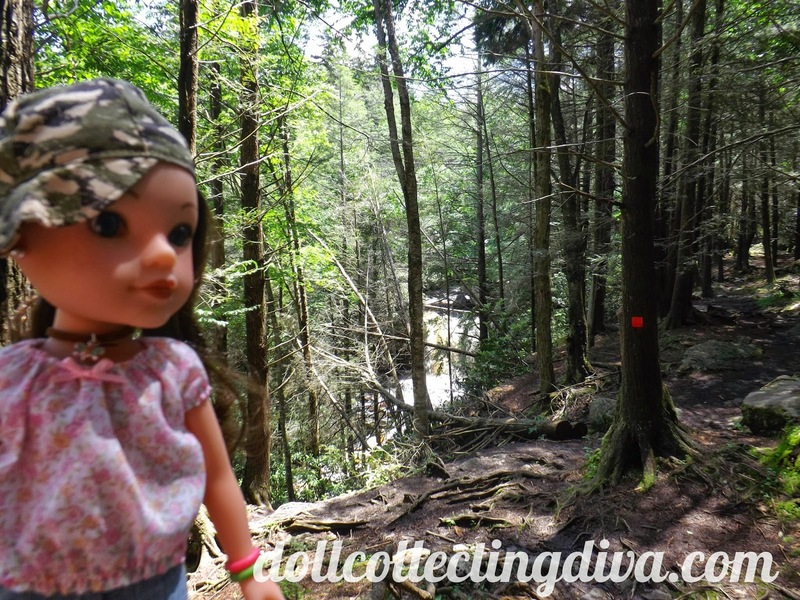 We pulled into the picnic area and got out to take some pictures and explore. We walked down to the river and I collected a few pretty rocks. I had to be careful because the area was used for artillery training during WWII and there could still be unexploded shells there (they even had a sign at the visitors center). It was so neat to watch the climbers at the top of the rocks, I wanted to watch them longer but the rain started again, and we had to go home. 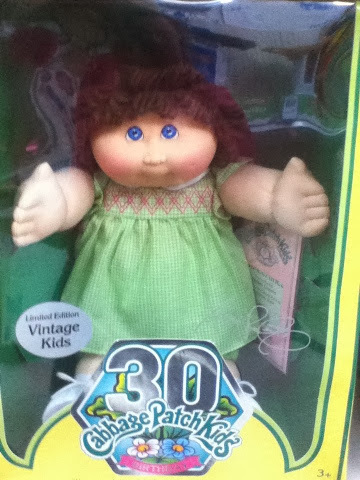 This year marks the thirtieth birthday of the iconic Cabbage Patch Kids. 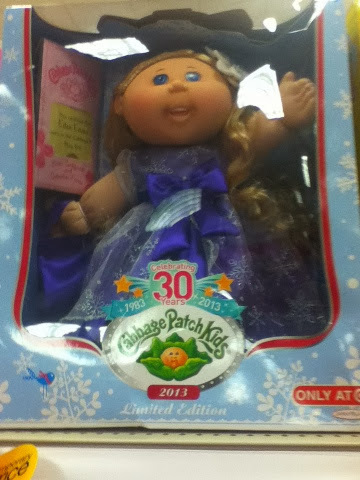 In honor of this they have created special anniversary edition dolls. 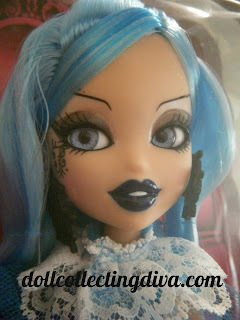 Each doll is wearing a party dress with the CPK logo print and has pink streaks in her hair. 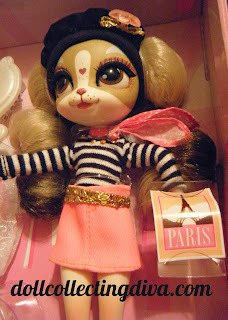 I haven't seen an anniversary edition boy doll yet, I'm not sure if they are making any, but the girl dolls are cute. 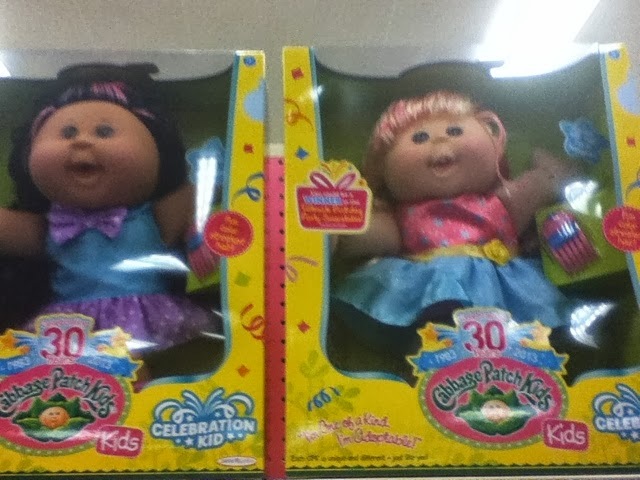 Both of the anniversary dolls I saw had the same first name and a different middle name. 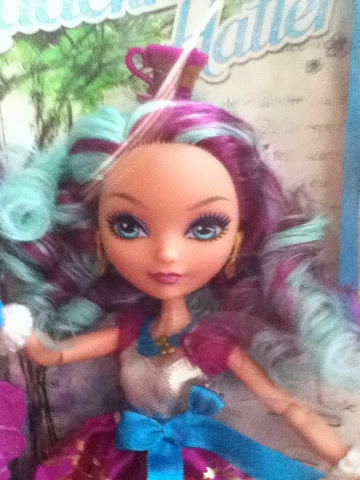 I'm not sure if this is a trend or not I will have to check more dolls. 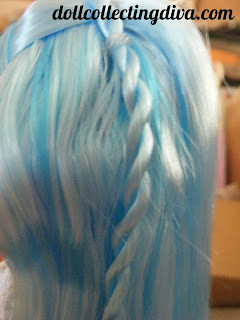 I think I might add one of these to my collection soon just because I like the streaks. 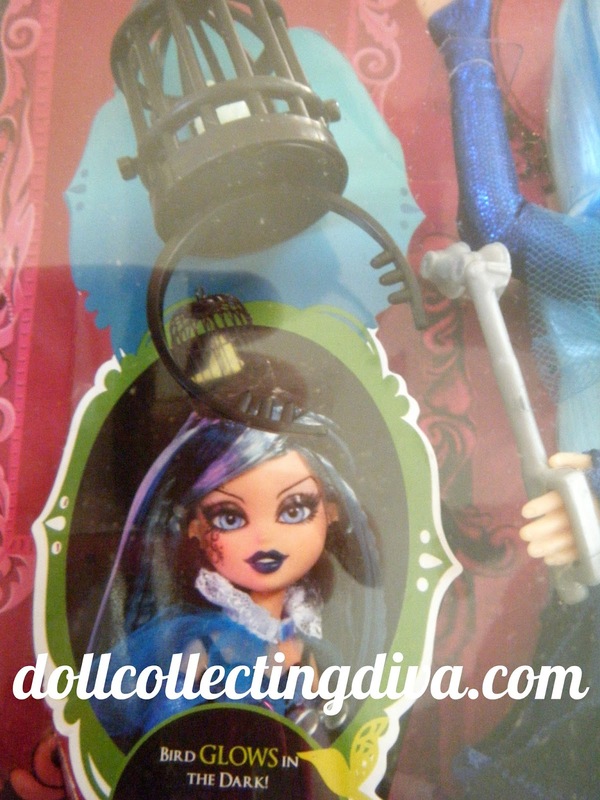 I sure it's no surprise that Ever After High will be making its official debut at Walmart and Target at the end of the month, just in time for the beginning of the holiday shopping season. I am glad that I don't have to go all the way to a Justice store to get them anymore. The prices at least right now are at the $20 range on Walmart's and Target's websites. You can preorder the four single basic dolls, the Ashlynn and Hunter 2 pack, and the diary on Walmart.com with a release date of October 27. I'm really looking forward to the two pack and I'm glad that it will be available at a store closer to me than Justice. 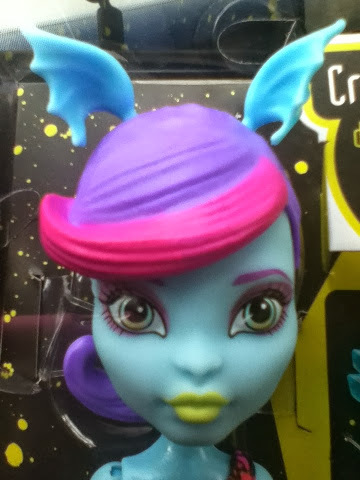 Last weekend on an impromptu shopping trip I came across the Monster High Color Me Creepy Sea Monster set. 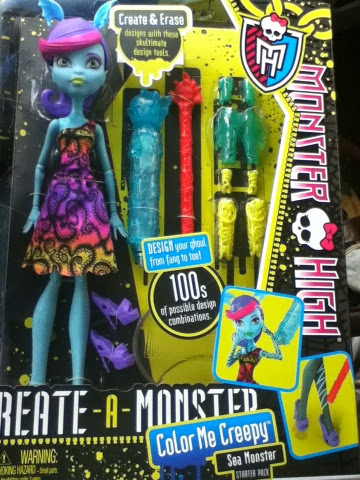 I love the Create A Monsters so I bought the set. 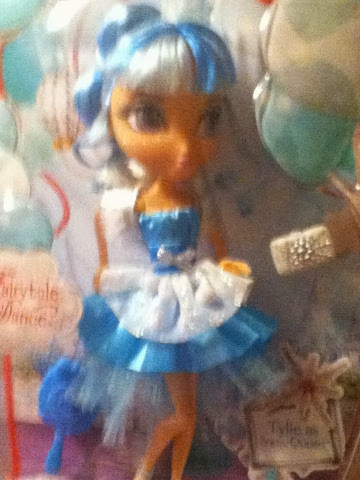 The CMC sets come with the already assembled doll, an outfit, a wig, shoes, a red friction stylus, a blue ice stylus, and some arm and leg decorations. 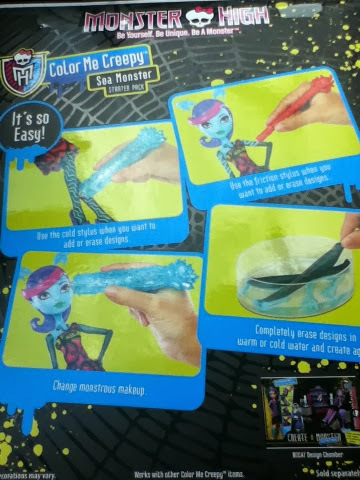 I half unboxed the doll to get to the instructions and the first thing I noticed was that the color change feature is temperature based (reminds me of a Barbie I had as a kid). This feature bothers me a bit because the instructions state that you fill the insert that's in the blue stylus with water and put it in the freezer for a few hours. Who wants to open a toy and find out they have to wait a few hours to play with it? Not me and definitely not any child I know. This also means that once the area of the doll warms up again the drawings fade, usually in a few minutes. I can see where this provides an unlimited drawing area, but I can see this frustrating some kids who have to keep going back over what they drew to make it visible again. You can also dip the arms and legs in cold water and draw on them with the friction stylus, but this way doesn't work as well, at least not for me. On the plus side if you take the ice stylus over the top of the torso (the only part of the torso that can be drawn on) there is a neat design hidden. Also the cute ears or antenna, which ever they may be (there are molded ears on the head) attach into holes on the wig to better keep them in place. 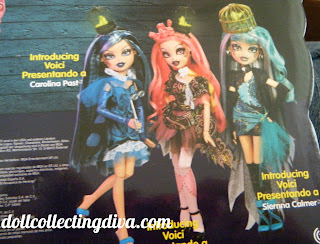 I like that this set has add on packs that contain extra wigs, clothes and fins, which are great and can be used to accessorize some of the other dolls but overall I prefer the Create A Monsters. 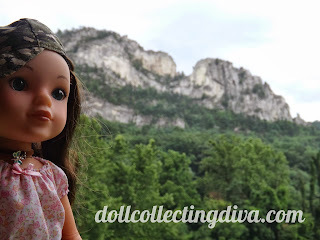 It has been quite a busy summer here in The Doll Room. 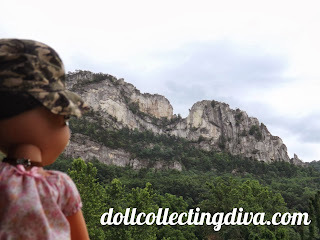 Many members have joined the doll family here, and one of them has been on a few adventures. Hearts for Hearts girl Dell joined the family here earlier in the summer and proved to be quite the travel companion. 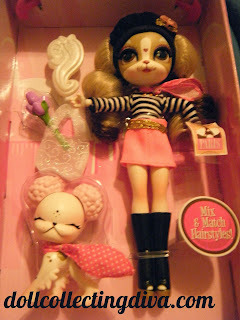 (Hearts for Hearts girls are 14 inches tall and completely vinyl). You will be seeing some of her excursions over the next several weeks and it will be followed by a special giveaway. Whew its nice to be out of that store and out of that box. I'm so excited to be going on adventures with my new family and finally getting to stretch my legs. My new family likes to hike and we are going to hike near some waterfalls in West Virginia. I cant wait to see a waterfall, I hope they are as pretty as they look on the brochure. Wow there are a lot of waterfalls here, and lots of nice trails to hike too. I'm having so much fun, its too bad its starting to rain. Oh poo, the rain ended the trip early, but that's ok, I know we will be going on more adventures soon. I was out shopping over the weekend and saw something I had not noticed before. 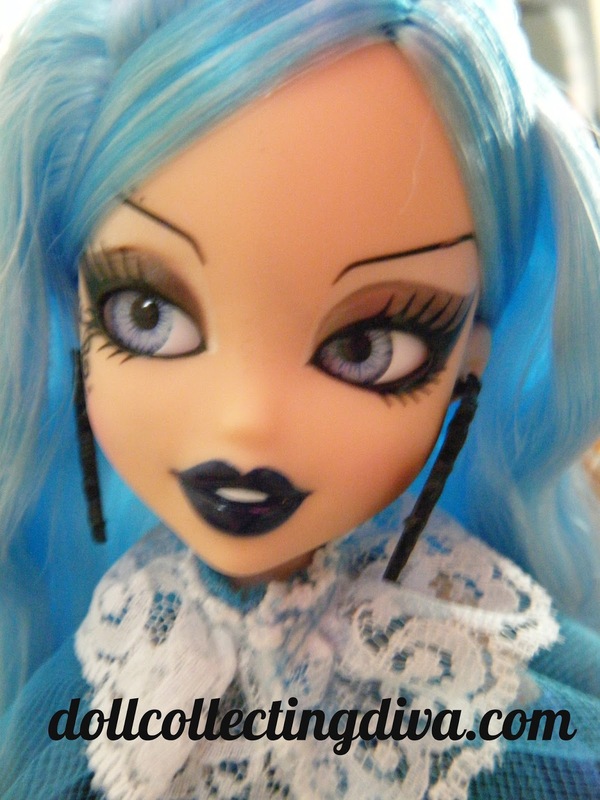 In two different stores I saw dolls that looked like Monster High dolls but weren't. 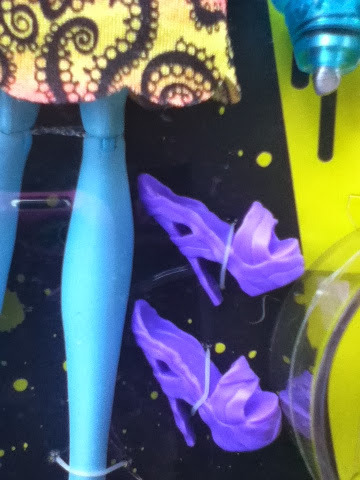 I didn't get a picture of the first dolls,but they came in two packs and were brightly colored. 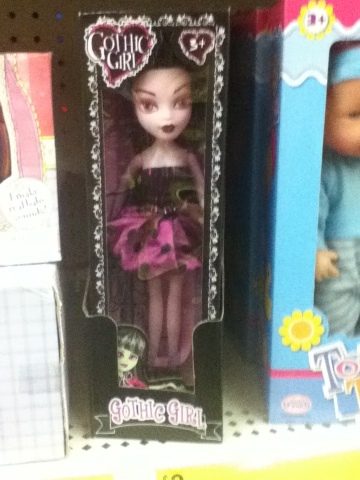 At the second store I saw another version of dolls by a different manufacturer. These Gothic Girls closely resemble Monster High dolls. The one in the box reminds me of Draculaura and the one on the box art looks a lot like Frankie. 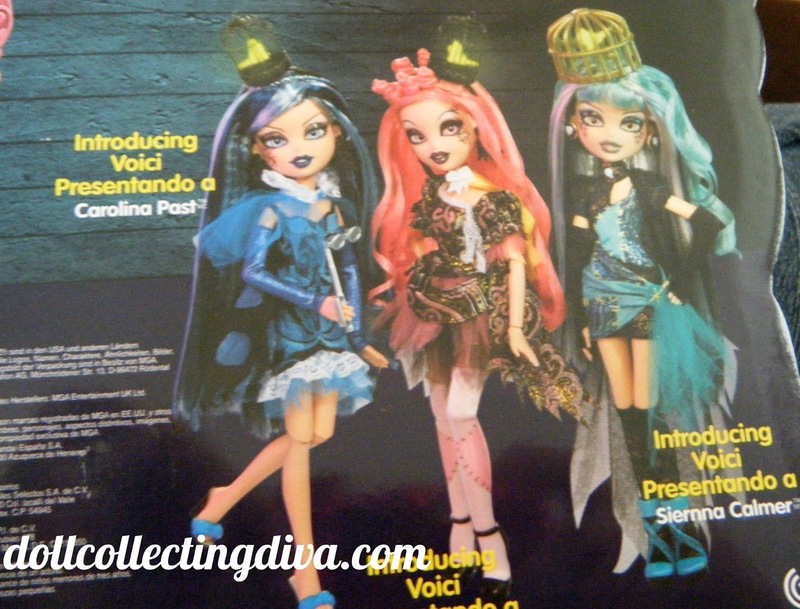 They are priced just a bit cheaper than a budget line Monster High doll, but it looks like the clothes should be interchangeable. 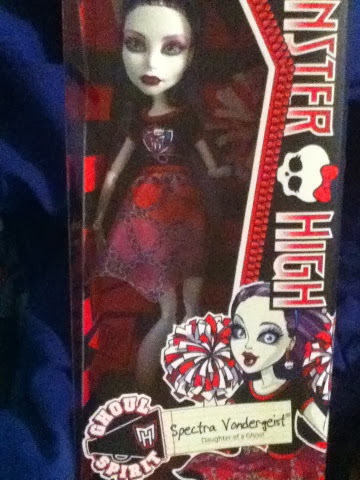 Her profile and diary have already been added to the Monster High Wikia. The upcoming Monster High doll Jane Boolittle, daughter of Dr. Boolittle, made her official debut on Facebook earlier this week. 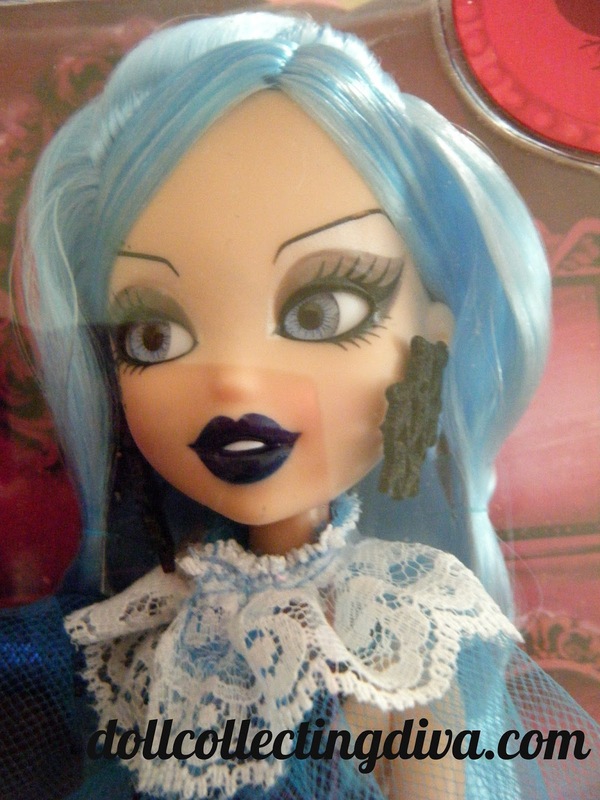 It has been rumored that she may possibly be the Friday the 13th doll for December. It is only a rumor but we do know for sure that she will be available toward the end of the year or the beginning of 2014. Isabelle's last name is Palmer and her big unveiling will be tomorrow December 31, on Good Morning America. 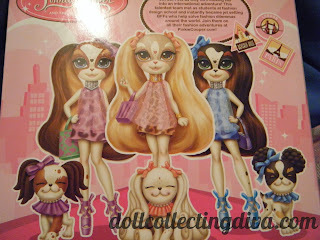 DollyDormDiaries has a few great photo stories and comparison photos between McKenna, Lanie and Isabelle. Isabelle's eyes seem to be the same color as Lanie's and her hair is a bit darker. Isabelle has a pet kitten named Tutu, which is a change, since the last three GotY have had pet dogs. American Girl has added hints, clues and games based on the upcoming girl of the year. I think its great that they are drawing focus to her fashion designing and not just her dancing, and the game demonstrates that. Head to the website and check it out. 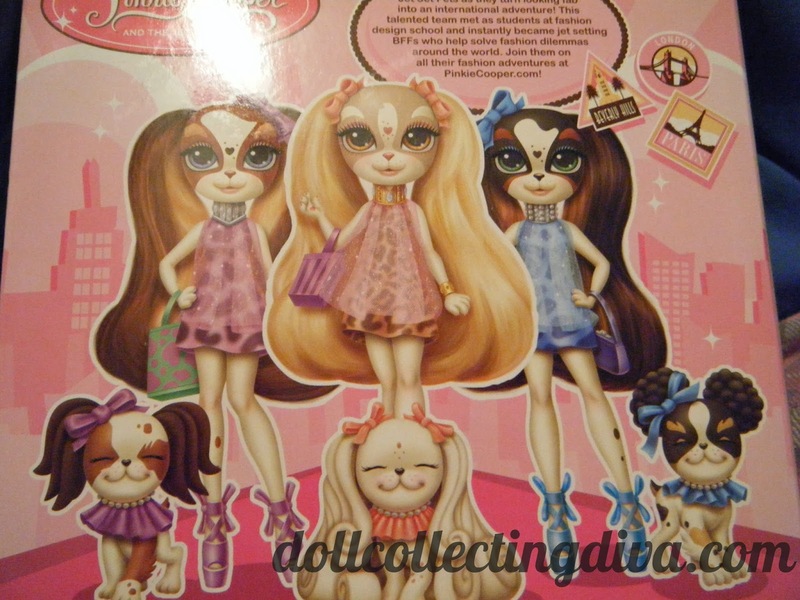 agoverseasfan has posted on her YouTube channel a preview of the new AG catalog that has Isabelle and her collection in it. I have to admit I really like the mix and match pieces and her accessories. The Studio Set is great, pricey but very nice with lots of pieces. If you haven't noticed yet there is a price increase again for 2014.
dolldiaries.com has also posted some pics of Mini Isabelle from someone who had preordered her. 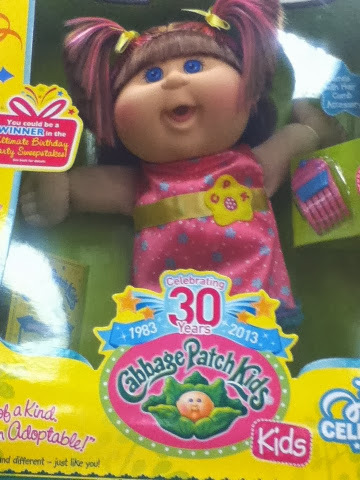 I think she's cute with the dark pink hair underneath but her shirt looks huge and very unflattering. 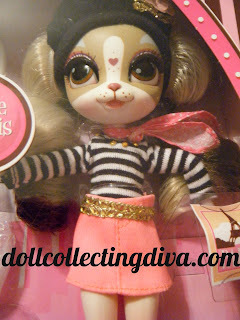 dolldiaries.com has posted photos from an eBay auction that had Isabelle for sale. 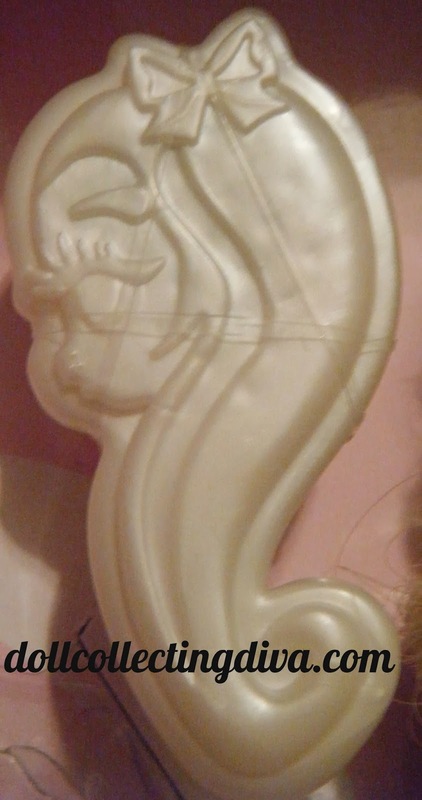 She has blond hair, hazel eyes and the classic face mold. According to the listing she has a hair piece to make her hair look like it is ombre. The GOTY 2014 will be made as a mini doll and is available for preorder on barnesandnoble.com. The book descriptions for the 2014 Girl of the Year are now on Amazon. It looks like we can be certain that she will be a ballerina, and most likely has an interest in costume design. 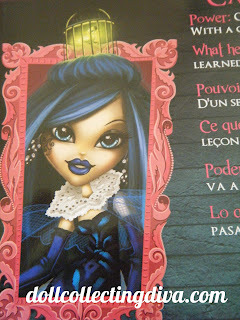 Unlike recent GOTYs she has a three book series instead of a two book series. We are now waiting on a name for the 2014 GOTY (it has been rumored her name will be Isabelle). The books were written by Laurence Yep who wrote the books for previous Girl of the Year Mia. We also know that the 2014 GOTY will have a movie. The rumor has been circulating off and on for years and was made official today. 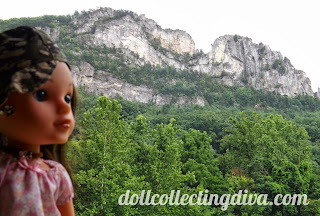 American Girl has posted on their website that they are officially retiring Molly and all of her collection, including Emily. My guess will be that they are ceasing production now and as soon as the stock of these items has been depleted they will be moved to the archived section. 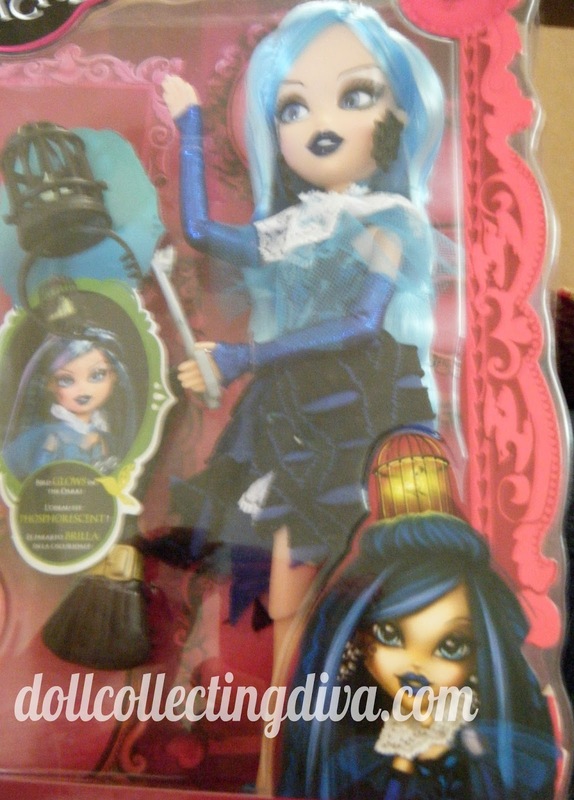 I'm a big fan of the historicals and am very sad to see Molly, who is the last of the original dolls, be retired. I hope that the historical taking her place will be just as educational and unique as she is. The rumor is already starting that the next historical will be from the 1950's, I guess we will have to wait and see. Until then if there is anything in Molly's collection that you have put off buying, this is your last chance unless you count eBay. 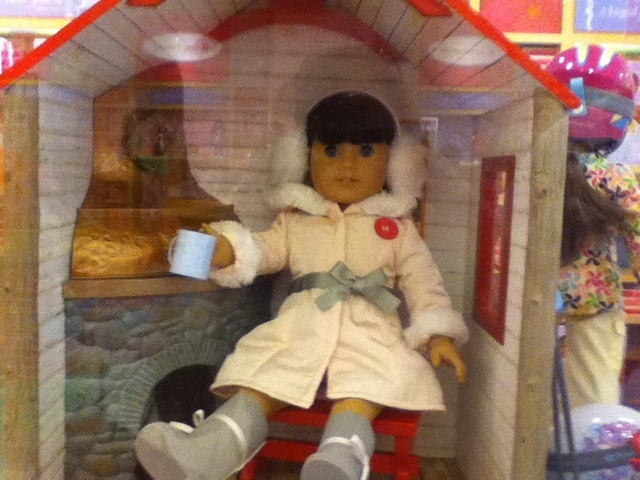 A blogger on another site had the chance to visit the new American girl store in Columbus, Ohio before it opens tomorrow, and she took some fabulous pictures of all the new items. 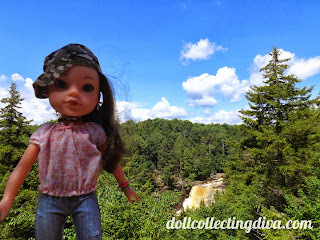 Some of the highlights of this release are a new outfit for Saige (love it), a science set (again, love it), clip in colored streaks and other hairpieces, and two new My American Girl dolls. 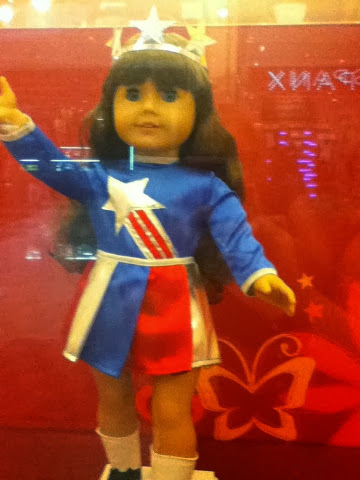 Over the weekend I was in the DC area and decided to stop by the Tyson's Corner Mall which is home to the Washington DC American Girl store. For a Saturday it was a lot less crowded than the last time I was there. I was able to take a little longer to browse and enjoy the displays. I am a big fan of the Historical Collection and those displays are my favorites. I loved Caroline's parlor display and Rebecca's bed. Molly's swimsuit was another item I saw that is now on my want list. The displays are so well done, I wish I had room to display my collection like that. Upstairs is the bistro and there was a birthday party going on while I was there. The goodies looked so yummy but I didn't try any, maybe next time. The Historical Collection and the Girl of the Year collection is upstairs. 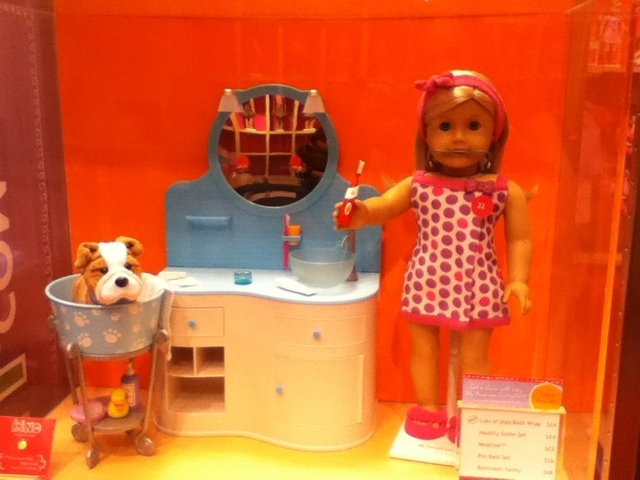 Downstairs is the salon and several girls were getting new summer hair styles for their dolls. The design your own doll T-shirt is next to the salon and the My American Girls, Bitty Twins and Bitty Baby are all downstairs. 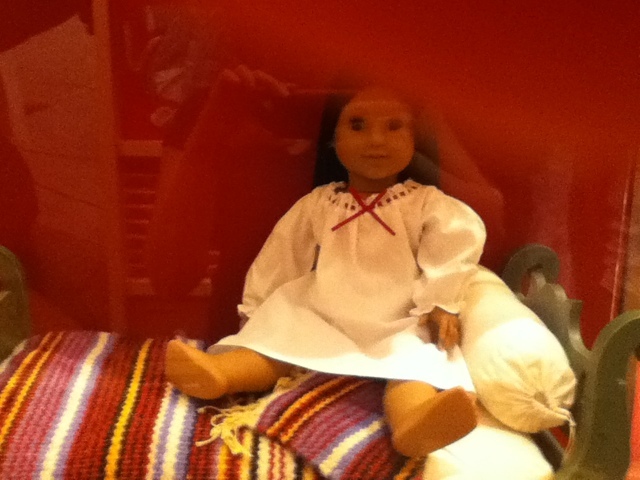 I enjoyed looking at all the different My American Girl dolls up close. I purchased some of the store exclusives while I was there, the berry skirtini was sold out so I'm glad I got that on my last trip. Saige's Sparkle dress was also sold out, but I did manage to get the exclusive pajama accessories with the stuffed mini Coconut. This trip was by far the better of my three trips to the store. Sorry for the photo quality. I took these with my phone, I was expecting a more crowded store so I didn't take my camera.